Ok, sorry, again, I didn't update in a while, did I? Well, busy, I guess. Tired most of the time, and often being away from the computer. I don't have the energy to sit down here to long. Hopefully it'll get better again. I do need a brake. A brake from knitting, well, better said : knitting for others. I'm constantly knitting for others and getting no thank you or gratitude at all. It's so tiring. My mom asked me to knit her a laice cardigan (a long one, if anyone knows any free or downloadable patterns, let me know!). She thought it would be cheaper then buying one at the store. Not really counting that I'm a yarn snob. But I found some super yarn at a really nice price (at my fave LYS!). Now the problem is my mom has never been supportive towards my crafts. Somehow, being crafty herself, she doesn't seem to understand the things I like to do. Her fave mainly is flower arranging right now (and she's great at it, really!! ), she used to do jewelry. She's sews. She used to knit but thinks it's a waste of time now (??). When I started penpalling she found it a true waste of time. When I started my collage art she just couldn't understand why I spend so much money on this stuff (though she and my sisters were always in my room to get crafty stuff for school projects etc., I think she misses that now, realizing how much my material was worth!). When I started knitting she really thought I was nuts. So it's kinda hard to get motivated. I'm slowly moving forward on the cardigan for my grandfather but most of it is plain boring stockinette and I already had to rip a couple of times. I guess it's because of the boring-ness of the whole thing. I swear, I'm not doing big projects for Christmas ever again. Then I also urgently need to put a huge package together for my SP who I've neglected so badly! Will be done over the weekend for sure! 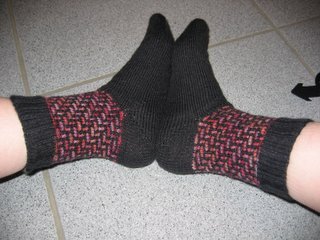 Finished them in little over a week, knitted only on the train and during breaks at work. Loved the pattern (really quick one too!!!) and the socks are super!! By the way, the new pattern for the KAL looks neat too! 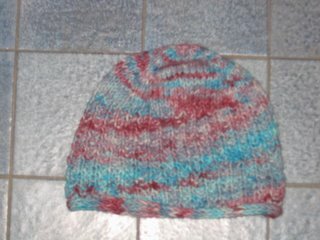 Not before Xmas though ... .
Knitted in about 2 days, lovely to wear, fits perfectly! Going to knit more real soon!!! So that's it for now, I think I'm back to my knitting, I'll try to update more over the weekend. 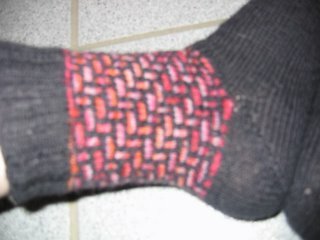 I adore the mosaic socks - where did you find the pattern? Re your mum - if it were me I wouldn't bother especially lace (urgh). I'm not being horrible but if she's that negative I wouldn't be able to knit it. 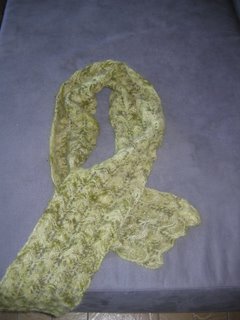 I think it is a free one you can print out in the patterns section and maybe you could knit more length to it? !